In the pump of the well, the pressure tank type was a main current so far. The accumulator type has increased in the small one recently. There is no water tank in this method. Moreover, because water doesn't come in contact directly with air, it is said it is sanitary. It digs and the well of my home. This photograph digs and is a well of my home of the country. A left well frame (Idutsu) digs and is a well of 90cm in the diameter. A right well frame puts the well pump by 75cm in the diameter 60cm in height. This well frame for is freeze proofing and protection of pumpThese are in the field. The depth of the well is about 4.2m, and always has about 2m depth. The above-ground part of the well frame is about 30cm. There is an amount of spring water during about 50 liter/minute or more. 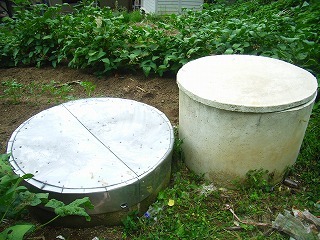 A concrete lid is done so that the foreign body should not enter the well and the stainless steel has been covered further. This cover is locked. The inside cannot be easily seen. It is impossible to dig by human strength when there are depth and an amount of spring water of this. It dug with a large-scale backhoe (heavy equipment) at the dry season. 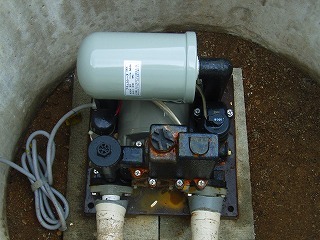 This is an inside of accumulator tank type shallow well pump (PAL-2531BR) of the three-phase circuit electric machine. It is an accumulator it is in the upper part of the center of this photograph. I think that the form of the pump is a cascade pump when seeing from the structure. There was air in the pressure tank, and the pressure of the well pump was secured by compressing this air, and water until the pump started next was supplied to the pump that I had been using in childhood. Air melts to water while using it, and air decreases to the method that there is air in the water tank (pressure tank type) gradually. Therefore, an automatic breather is necessary. 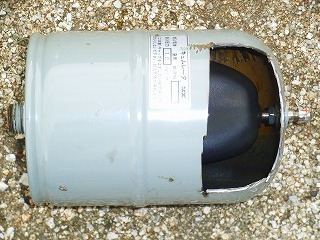 This pump loses the water tank by using the accumulator. Moreover, because water doesn't come in contact directly with air, it is said it is sanitary. Generally, the accumulator is an effective thing for the prevention of the water hammer (water hammering). 250W 100V60Hz 25mm 32L/min. 8m 12m 130-170kPa 2.5L/min. The well pump came to move and to stop frequently when about 12 years pass by setting up the well pump. It was trouble of the accumulator when having examined it. Water is coming out, when the cap of the valve of the accumulator is taken and inside rubber is pushed. Rubber seems to have torn very much. I think that I have the accumulator only by about ten years when thinking from the structure and the material. Accumulator was exchanged. The well pump might come to move and to stop frequently like the above-mentioned as for the well pump of the pressure tank type. In this case, there seem to be a lot of breakdowns of an automatic breather. The accumulator temporarily saves the thing and is an accumulator that is the balance of the supply and demand. This photograph is accumulator . Because the accumulator had broken down, it cut it by Sanda like seeing the inside. There was the one like the strong balloon that was able to be done by rubber in the inside. It is separated with rubber in this photograph though the valve has come in contact with rubber. The water of the well did not come out from the faucet when about six years passed by setting up the electric well pump. The pump moves when the pump is seen. It was hot when feeling the pump. The well water comes out from the faucet when the pump is stopped at once, the calling water is put in, and it operates. Apparently, the pump seems not to stop. The pressure switch and the flowing quantity switch work. The point of contact of the relay after the circuit had clung. The repair was exchanged for a large-scale relay of reserves. In the winding, it was a relay of AC100V and the contact capacity was 12A240V. It was used that they were two parallel points of contact.